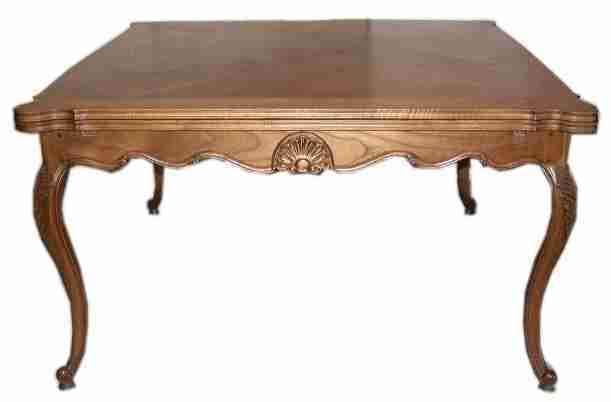 A French Louis XV style provincial 2 leaflets extension dining table with a cane weave parquetry top, hand carved rails and cabriole legs. It can seat up to 12 people when fully extended. The parquetry top is made in same timber and same color while the orientation of the timber grains reflects the light differently from different angle which makes the beauty of cane weave parquetry. 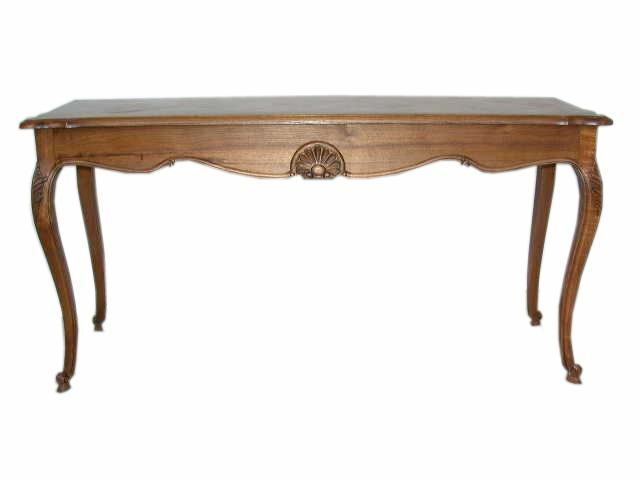 A Louis XV style, French provincial square extension dining table with 2 leaves with a cane weave parquetry top, hand carved rails and cabriole legs. It can seat up to 12 people when fully extended, and it is one of the popular sizes. A French provincial dining table with a cane weave parquetry top, Louis XV style, hand made and hand carved rails and cabriole legs. It is available in two sizes, can seat up to 8 or 10 people. 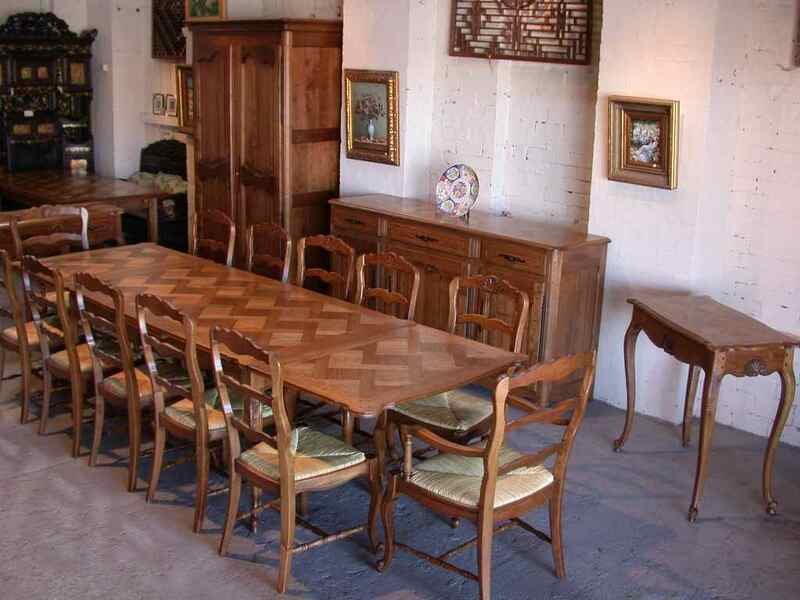 A French provincial dining table in solid oak with a cane weave parquetry top, Louis XV style, hand made and hand carved rails and cabriole legs, It is available in two sizes, can seat up to 8 or 10 people. 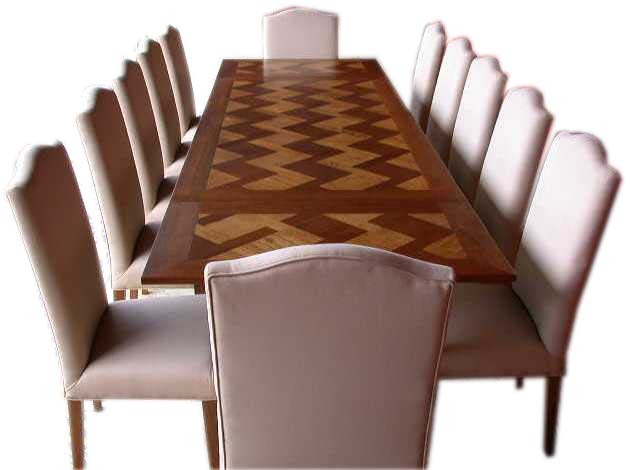 A French Provincial extension dining table with 2 leaves with a cane weave parquetry top on square tapered legs. 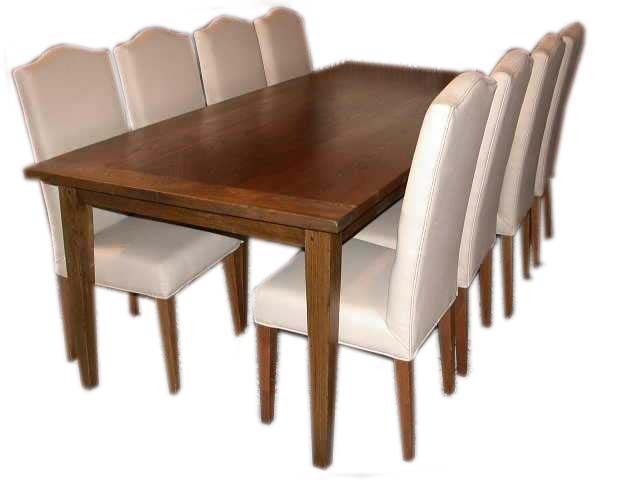 It can seat up to 12 people when fully extended, and it is one of the most popular sizes of the extension dining tables. The parquetry top is made in same timber and same color while the orientation of the timber grains reflects the light differently from defferent angles which makes the beauty of parquetry. it is hand made. 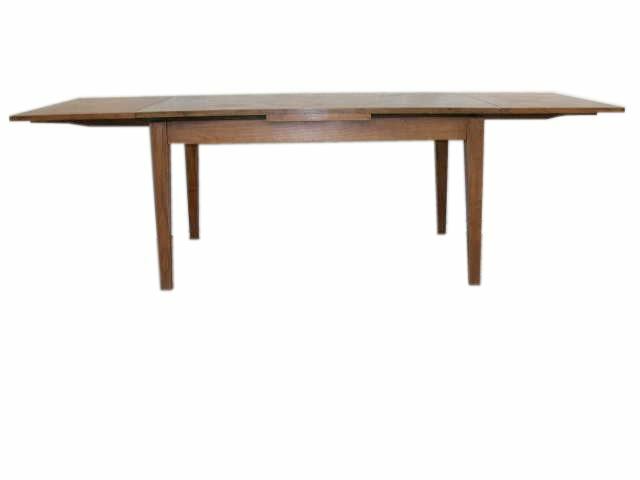 A French Provincial extension dining table with 2 leaves with a cane weave parquetry top on square tapered legs. It can seat up to 10 people when fully extended. The parquetry top is made in same timber and same color while the orientation of the timber grains reflects the light differently from different angle which makes the beauty of cane weave parquetry. This size is very good for apartment. it is hand made. 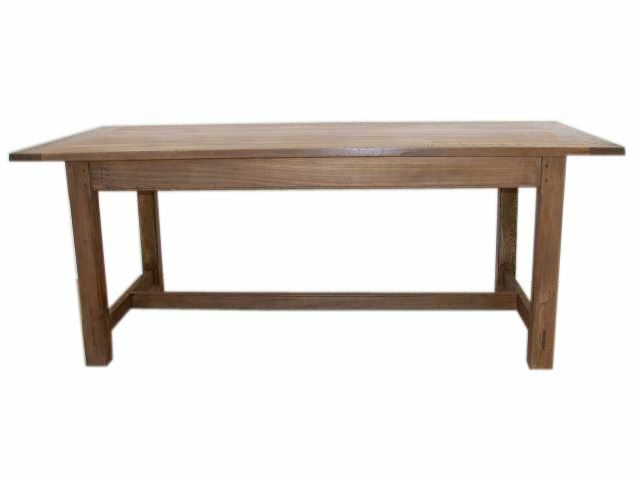 A traditional French Provincial farmhouse table with a thick plank top on square tapered legs, hand made in walnut and oak, available in two sizes, and it can seat 8 or 10 people. 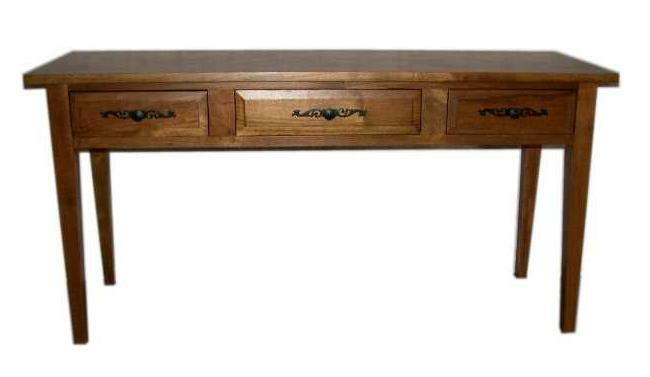 A French provincial 5-drawer desk in solid walnut with a cane weave parquetry top on cabriole legs, hand made and hand carved, Louis XV style. 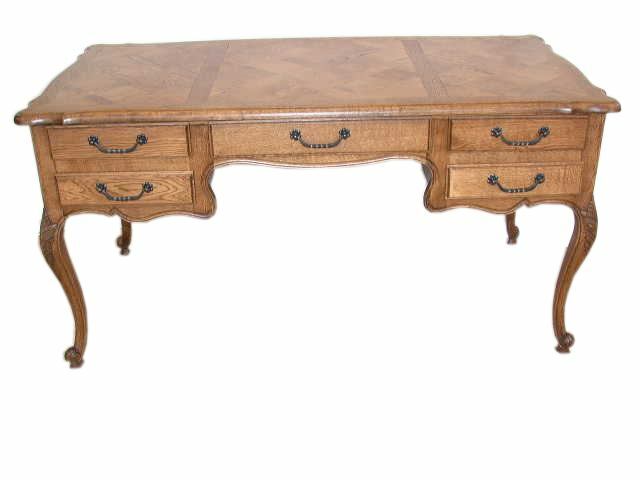 A French provincial 5-drawer desk in solid oak with a cane weave parquetry top on cabriole legs, hand made and hand carved, Louis XV style. A French provincial 3-drawer side table or console table with a cane weave parquetry top on cabriole legs, hand made and hand carved, Louis XV style. A French provincial side table or console table with a cane weave parquetry top on cabriole legs, hand made and hand carved, Louis XV style. 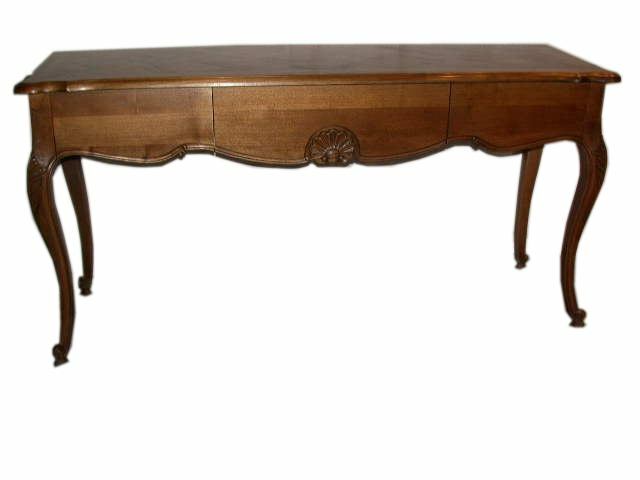 A French provincial hall table or console table with a drawer to the front, a cane weave parquetry top, on cabriole legs, Louis XV style, hand made and hand carved. 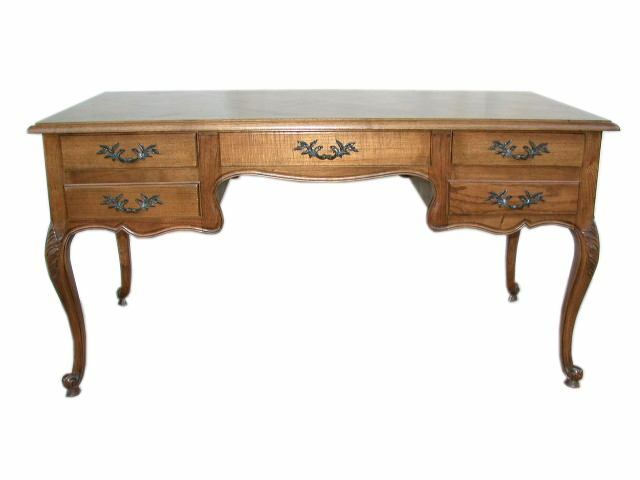 A French provincial hall table or console tale with a drawer to the front, a can weave parquetry top or a plank top on cabriole legs, hand made and hand carved, Louis XV style. 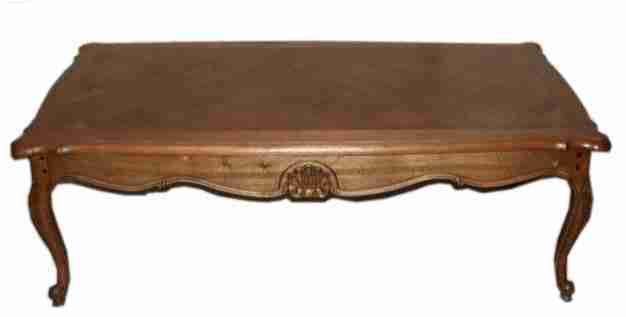 A French provincial coffee table in solid walnut with a cane weave parquetry top on cabriole legs, Louis XV style. It is available in two sizes below. 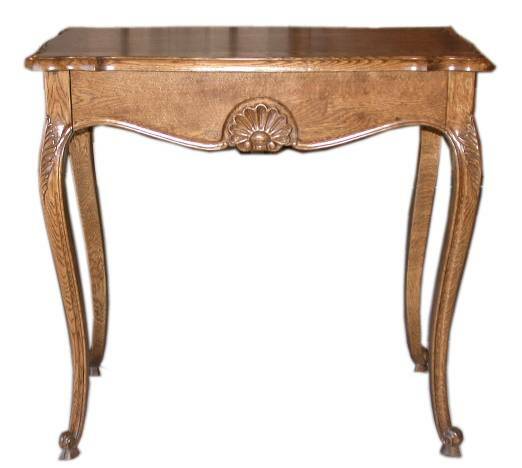 A Louis XV style, French provincial lamp table with a cane weave parquetry top on cabriole legs, available in walnut and oak. 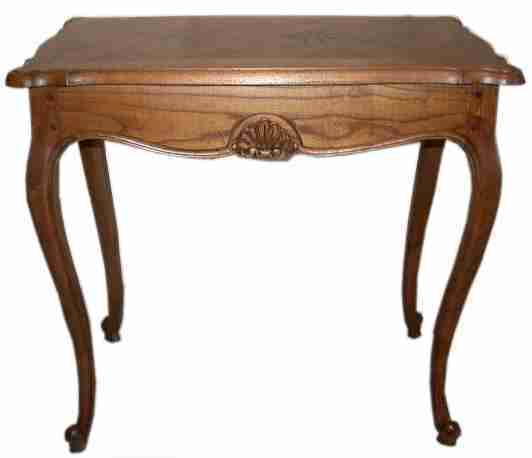 French provincial side table or console table with three drawers in solid walnut, a cane weave parquetry top on square tapered legs, matching the Provence ext Dining Tables. 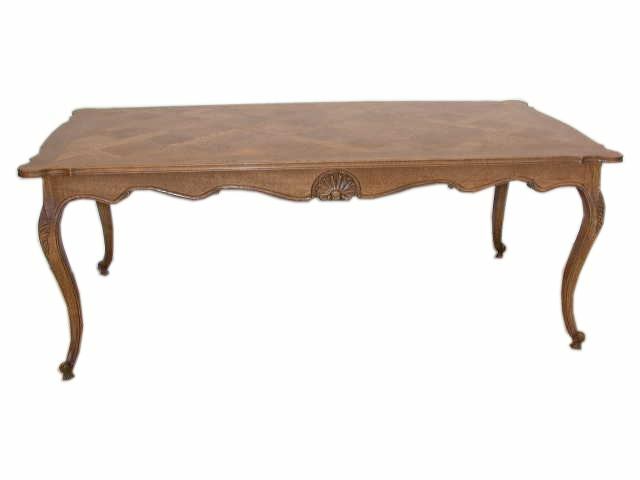 French provincial coffee table in solid walnut with a cane weave parquetry top on square tapered legs, matching the Provence Dining Tables. 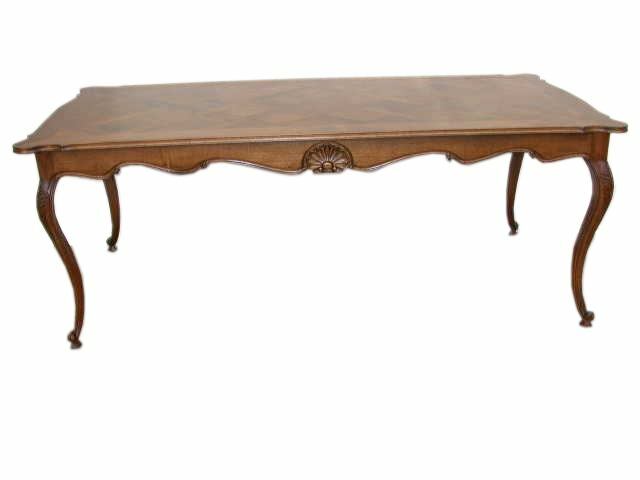 French provincial style walnut Lamp Table with lovely cane weave parquetry top on square tapered legs, matching the Provence Dining Tables. 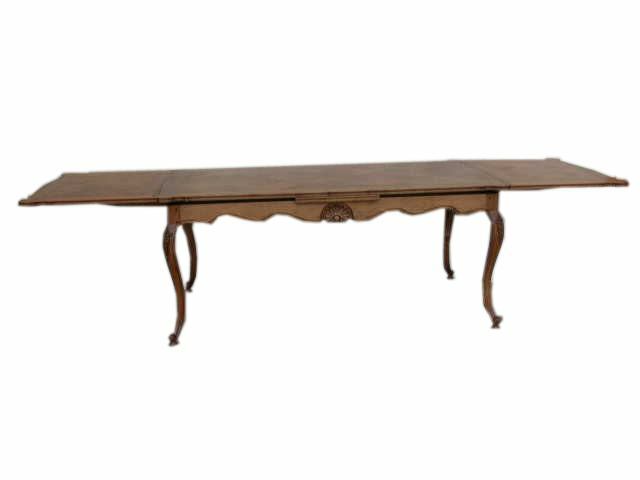 French Provincial style refectory table or dining table with a thick plank top on a stretcher base. It is available in two sizes, and can seat 8 or 10 people.